It is the world who got lucky. We waited patiently. For over eight years, we waited. Finally, the day arrived with grand celebration: the release of a new Daft Punk album! (No, we don't accept the 2007 live album, "Alive 2007", as an official new album, though it's an awesome recording in its own right.) We had no idea what to expect with Random Access Memories: after all, each album brought something completely different to the table, always sounding far detached from their previous efforts. Discovery moved in a disco-rich direction, while Human After All really took us by surprise by sounding rather brash and unpolished. All I can say is that if Human After All was indeed unpolished, then Random Access Memories is doing its best to make up for that by being, by far, THE most polished and detail-oriented Daft Punk album yet. And it is, yet again, like nothing they've ever produced. Daft Punk has used their robotic abilities to go back in time to the 1970s and early 1980s for inspiration. Instead of primarily using synthesizers and samples from the more obscure corners of the industry, they have resorted to the shocking method of production: using REAL instruments! Synthesizers are still present, but their influence has severely dwindled in favour of genuine bass guitars, pianos, and drum sets. They have pulled a menagerie of guest collaborators as well to sprinkle their own special fairy dust into the mix, including Giorgio Moroder, Pharrell Williams, Nile Rodgers, and Julian Casablancas. It's still at heart a Daft Punk album, but the influences of others cannot be ignored. The opening track, Give Life Back To Music, suddenly becomes the group's new mantra. Their previous three albums were all very electronic, very robotic, just like their public alter egos (as, in interviews, they would wear robot costumes so as not to be seen). 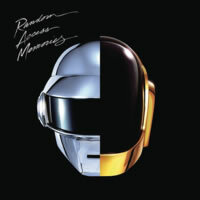 But Random Access Memories is something different, perhaps giving more humanity back to the duo, despite the album title making direct reference to computer memory. Immediately, we're bombarded with guitars and space-age noise before the real song begins: some basic drumming and a funky guitar riff as played by Nile Rodgers, known for his production history with such artista as David Bowie, Madonna, and Duran Duran. The vocoder also comes into play as Daft Punk themselves sing along, "Let the music in tonight / Just turn on the music / Let the music of your life / Give life back to music". This will be the first of many vocoded songs, and I actually consider this effect to be a saving grace for the album; if it weren't for Daft Punk's use of the vocoder, I'd say some of the songs would be downright dull. "Give Life Back To Music" serves as a suitable introduction to what types of sounds you can expect from the rest of the album, although it does not quite qualify as a highlight. Daft Punk is already prepared to slow things down by the second song. The Game Of Love, also using a funky bassline, is quite chilled and would belong in a lounge proper. Using Daft Punk's vocoded vocals, I could best compare this to "Something About Us" from their Discovery album. I much enjoy this relaxed take. The lyrics also seem to confirm my earlier suggestion of Daft Punk trying to bring humanity back to their music, as they speak specifically about losing a relationship with a loved one. The best part comes closer to the end when the vocoder is used to create its own harmonious melody over the instrumentals. Excellent stuff. Giorgio By Moroder brings legendary producer and composer Giorgio Moroder literally to the forefront, as it features the man himself delivering a monologue about how he became a musician and how the simple click track inadvertently revolutionized the scene. The song is a 9-minute ode that also honours the man through older-sounding synthesizers in an electro-boom, leading eventually to a more symphonic sound but ultimately a reflection of how music sounded when Moroder began his work. Though the track is indeed lengthy, there is enough wild variation to keep the sound fairly fresh, and it's a pleasant novelty. Within, with its piano introduction, reminded me of a melancholy classical track before hitting its main melody with organs and a subdued set of hi-hats as its primary form of percussion (before a metronome rears its head). Daft Punk's vocoded vocals return, and they sound as sad as ever. It's another slow song, but not one to be missed. Julian Casablancas, frontman for The Strokes, pays the duo a visit in Instant Crush. His delivery is rather subdued, but that seems to work in the song's favour. With quick delivery, the chorus of the song alone is immediately catchy. The instrumentation, on the other hand, seems to be average, at least until the added synthesizers in the chorus add an extra layer of depth, though you'll really be listening for vocals. Another highlight of the album soon follows with Lose Yourself To Dance featuring American hip sensation Pharrell Williams. Though I have never been a major fan of his work in the past ("Drop It Like It's Hot" featuring Snoop Dogg serving as a prime example), he makes up for his missteps here with soulful singing alongside the swift guitar work of Nile Rodgers again with a disco twist. The shouts of "Lose yourself to dance" are infectious, but things only get better with Daft Punk chime in with bass-laden vocoded backing chants before stepping in full force with some serious melodic vocals. Those are easily the best part of the song and complement Pharrell's chooning well. Touch features Paul Williams, and although this is, as Daft Punk have said themselves, the most complex song on the album, it's also, regrettably, the one I am most likely to skip over. The first two minutes mostly feel like it comes straight out of a sci-fi movie, complete with psychotic voice effects and strange static noise. The rest of the song boasts so many genres intertwining at once, ranging from high-tempo honky-tonk dance to sluggishly-paced choir work to galactic chillout. While I applaud their efforts, and while the song itself is impressive from a purely auditory perspective, it doesn't keep me hooked for multiple listens. It may be more of a "once in a while" kind of track. If you keep up with Daft Punk at all, Get Lucky should be rather familiar. Featuring that jiving guitar hook that gets people shuffling and Pharrell Williams' vocals again, we're learning just how he plans of getting lucky -- and, apparently, he doesn't mean anything sexual by that! Instead, he's referring to discovering genuine connections with another person. That's nice. The version on the radio gave us everything we needed, including Daft Punk's wicked vocoder work, reiterating our interest in staying up all night to "get lucky". The album version adds about two minutes to the song, but there are absolutely no new ideas to justify the length, so this could have been shaved down to avoid excess fat. Then Beyond strikes us with an unexpected upbeat symphony, but really, the song quickly reverts into downtempo soul with Daft Punk once again taking over the microphone. Unfortunately, the vocoder work sounds far too enunciated, which actually detracts from its effectiveness. Or maybe it's just me. The instrumentation in the second half isn't particularly exciting, but it still works. Motherboard is one of the few instrumental tracks here, filled with more frantic beats and a variety of intertwining instruments, including acoustic guitar plucks and even a happy flute! The song gets grittier later on with additional brash percussion. Still, it's fairly relaxing and worth a spin. It's a wonderful distraction before we get to Fragments Of Time. Featuring Todd Edwards, who also provided the vocals for Daft Punk's song "Face To Face" on the Discovery album. If there was a song that doesn't sound at ALL like Daft Punk, this one is it. At times, it sounds closer to country than electronic/disco music. Though the bassline brings back sparse memories of Daft Punk, it sadly lacks a solid pull factor into late into the song when a vocoded guitar spreads its wings and gives the song a much-needed identity. Still, if there is one track I tend to avoid from the album, it's Fragments Of Time, simply because it's the most generic-sounding of the bunch. When I first heard Doin' It Right, I was hooked. That was it. Mind blown. It's actually the most minimalist and simple offering on the album, but complexity doesn't necessarily breed superior results. Daft Punk immediately chimes in with a vocoded harmony-laden melody as they sing, "Doin' it right / Everybody will be dancing / And we'll be feeling it right / Everybody will be dancing". The vocals here serve as the primary instrumentation over some basic drumwork, but that's all we need, as it's way too catchy to ruin with anything else. And Panda Bear (part of the Animal Collective) chimes in with his own simple lyrics as well, adding an extra dimension. It was the last song added to the album, but certainly one of the best experiments as well. So there you have it: Daft Punk's return to the limelight after stepping away from the studio for quite a long time. Has their time away been well spent? The answer is a resounding yes. Though it is not as danceable or electronic as everything that came before it, Random Access Memories is easily Daft Punk's most mature and well-rounded release to date. Even if I wasn't entirely keen on every song, I still couldn't help but be impressed by each one. It is clear that they put all of their heart, soul, and (for the robotic aspect) valve lubrication into their music, making for an amazing album. I only hope that we don't have to wait another eight years for more.